Chances are if you’ve clicked this post, you either have a Great Dane or are considering getting one. We are a nation of dog lovers and one of the biggest, best pooches is this majestic breed. But, as with any dog, you need to ensure that you can meet the pup’s every want and need in order for him or her to live a long, happy and healthy life as a part of your family. So, are you cut out to be a Great Dane owner? Are you ready for this rather large bundle of joy to come bouncing into your life? Read on and find out! A clue to the most prominent feature of the Great Dane lies in the name: they are truly great. They are the largest dog breed in the world. Trust us when we say, you definitely would not miss one when passing one in the street. The breed will generally reach between two feet and four inches to two feet and ten inches at the shoulder. They will generally weigh around 100 to 200 pounds. They are large, we cannot emphasize that enough. So if you live in a box apartment or a one bedroom studio, you may like to consider a smaller option. These are ideal dogs for someone with a large property. You need plenty of living space for the pooch to stretch those long legs out. An expansive garden is also preferable for your four-legged friend to explore and exercise all at once. If you are a very house proud person, bear in mind that this breed does shed and is also likely to drool. So prepare to have a lint roller at hand and slobber marks on your furniture. Keeping a Great Dane doesn’t come cheap. First of all, the initial cost of a puppy will set you back a fair amount. Consider adopting! This will give you a cheaper pup who is in need of a loving home. You will need to meet their general health needs. This means investing in the best flea and tick medicine for dogs, regular health checkups, and monthly pet insurance payments. You will also need items for their comfort: a large bed, toys, and treats on top of their regular food. 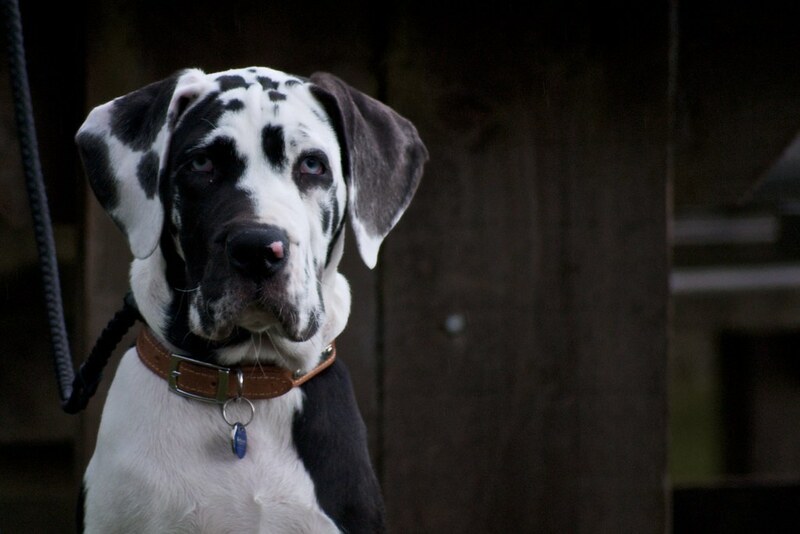 Great Danes aren’t the ideal option for someone who has never had a dog before. So if you’re going to be a first time owner, consider something a little lower maintenance. The dog’s huge size means that only experienced handlers will be able to cater to the pup’s needs. As well as their size, they are highly sensitive individuals and can become easily frightened or timid. If you have a large family, not to worry. These are the perfect family dog. They are highly sociable with adults and children. If you already have pets, not to worry. They are most often also fond of other dogs and other animals. They are also extremely friendly with strangers, so if you’re looking for a guard dog, look somewhere else. The Great Dane is more likely to greet intruders with sloppy kisses than scaring them away. As you can probably guess, such a large breed requires a lot of exercise. They have long legs to stretch out, plenty of muscles to work out and high energy levels. So they will need a lengthy and vigorous walk every single day. If you suffer from a health condition, you may be better opting for a lazier dog. Alternatively, if you are set on a Great Dane, be prepared to hire a reliable dog walker to take your pooch on a stroll every day.